So if you didn't watch my beauty swap that I did earlier last week then you wouldn't know that I received some beautiful makeup palettes that I have been playing around with ever since! I put together this look for an event that I had on the weekend and wanted to share the bronze eye and pink lips look I came up with. Included in this article also is the outfit that I paired with this look which consists of a monochrome theme so keep reading for more info on how I created this look and what I wore. Face- Chanel Mat Lumiere Foundation, Maybelline Age Rewind Foundation, MAC Studio Sculpt Concealer, Maybelline SuperStay Concealer (light colour to highlight with), MAC Pro Longwear Concealer (dark colour to contour with) and MUF HD Finishing Powder. Eyes- Essence Brow Pencil, Essence Stay With Me Eye Primer, Urban Decay Naked Palette, Lorac Pro Palette, Rimmel Gel Liner and Maybelline Cat Eye Mascara. Now onto the outfit; I put together this monochrome look to compliment my makeup as I didn't want any colours clashing with my lip colour and wanted the main colour focus to be on Pink Nouveau. I started of with a base of a basic black bandage skirt (well that's a tongue twister) and matched it with a white peplum spaghetti strap top creating the basis of this monochromatic theme. 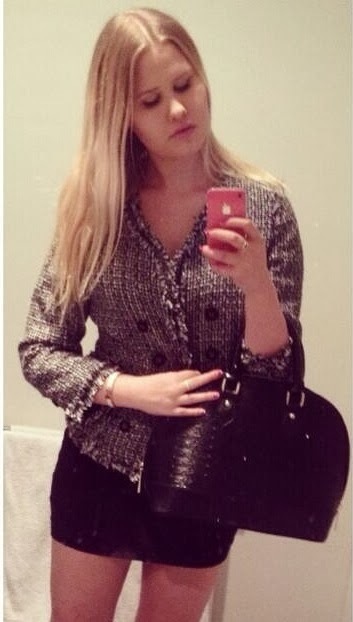 Later on, I further continued the monochrome with the black and white tweed blazer pictured below. Unfortunately I didn't get a photo of myself wearing it on the night but the picture below shows another occasion when I wore it. I feel like the blazer gives an extra layer of texture and creates additional depth to the look. It's also a perfect way of transitioning a Summer outfit into an Autumn one. That completes my face of the night and outfit of the night, I would typically have only shown my makeup but lately I have been enjoying sharing a bit of my fashion taste with you all. As you can probably tell, I don't typically spend much money on clothes thus making them affordable because trends go in and out faster than when you drive through a McDonald's (coming from someone who doesn't eat maccas...that was a weird analogy). However, I do enjoy splurging on jewellery, accessories and bags as those are items that are so versatile and will last a lifetime.